Peña Villamil, D.M. ; Llorens, J.; Sastre, R.; Crespo, D.; Tristancho, J. The current prototype’s key contribution to the field of light-weight structures is that it is the first time that a pure tensegrity ring has been used in place of a compression ring. This design features a cladding structure for a sports arena, which consist of a ring-shaped outer section and a central roof structure. The ring-shaped outer section of the stadium consists of a tensegrity structure, which uses textile membranes in a place of conventional tension cables to bear the tensile forces occurring between the pressure elements. The supporting framework and spatial enclosure therefore become one an extension to the tension integrity principle. The central area of the roof is covered over by a Geiger dome, which in turn is a specific version of the tensegrity principle. Peña Villamil, D.M. [et al.]. 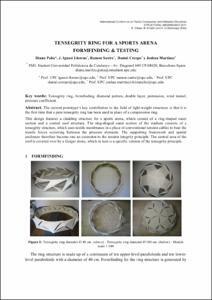 Tensegrity ring for a sports arena formfinding and testing. A: International Conference on Textile Composites and Inflatable Structures. "Structural Membranes 2011 - 5th International Conference on Textile Composites and Inflatable Structures". Barcelona: 2011, p. 1-8.